In late April, people begin claiming their spots for the King’s Day “world’s largest flea market”- the one day in the year you can sell belongings without a license and free from paying taxes on earnings. 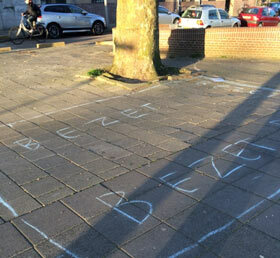 Areas are typically marked out using chalk or tape with the word “Bezet” written, which means “occupied”. King’s Day (Koningsdag), April 27th, in the Netherlands, previously Queen's Day (Koninginnedag), is the biggest festival of the year celebrating the birthday of Dutch King Willem-Alexander. The entire country is painted “orange” to pay tribute to the royal family – the House of Orange-Nassau. Two years ago I met this young lady, Jasmine, at Amsterdam50. It’s been amazing to see God answering prayers of drawing her nearer to Himself. She’s invited Jesus Christ to be her Savior, through what He did for her on the cross, and she’s doing her best to allow the King of Kings and Lord of Lords to occupy her heart, soul & mind. It’s remarkable to witness God changing lives through a person’s obedience and desire to live righteously and follow the Lord’s guidance through having a passion for His Word (the Bible) and following truth. “… he who began a good work in you will carry it on to completion until the day of Christ Jesus”. At 2 years old I moved from Africa to the Netherlands with my family. My mother was from Angola and father from Congo. I moved here with my mother and step dad, 7 sisters & 2 brothers. My mother left to go back to Africa when I was 13 years old. I never saw my mother again. She died in 2012, when I was 24 years old. My mother was my inspiration for faith and taught me from the Bible. I was insecure and never felt good enough, like a black sheep of the family. Every night, my mother would always tell me to look to the stars. She’d tell me that I’m one of those stars and not to lose it. She’d say, ”If you lose that, you lose everything”. She would always tell me about Jesus and to never lose him or my faith. For 7 years I’ve lived in Amsterdam. I’ve participated at the Amsterdam50 for 2 years. It's a wonderful church and has changed my life in many ways. God has shown me many things. One of those is how He revealed who He is and how I can be part of His church. I love worshipping God and have joined the worship team of Amsterdam50 as a singer. Through Amsterdam50 I met Linda. God has allowed me to get to know her and to learn from the wisdom, knowledge and blessings that God has given her. Linda has been kind to show me how good God is by sharing what she has learned which is now being passed on to me. I’m also part of a small group community that Linda leads. Each week we meet to share about our lives, what is going on personally, how we are handling life and how Jesus works through each of us. I’ve been changed a lot through the community because it has brought me closer to Jesus. I’ve come to realize more about God and I have come to fall in love also with Jesus more because I understand his character little bit. I also understand what he wants for me, what he desires from me and the plan he has for me. I attended 2 seminars that Linda taught. The Finding Your Gift Path impacted me by learning how God has given me spiritual gifts to combine with my beliefs for having a purpose and to be called to a ministry area. For me I learned that God made me for singing, intercessory prayer and serving. This reminds me who God made me to be and that He wants me to bless people, bringing them into His Kingdom. The Renewing of the Mind was inspiring and helped me to put on paper situations that I was going through, to reflect on how God wants me to think and not what the world thinks. I’ve learned not to react in my humanness, but to think about what the Bible says for how to react. I’m learning to have peace, to be patient and gentle in my responses, rather than reacting out of anger, fear or to fight. Due to the sea climate, it’s not often that we have much accumulation of snow during the winter, however from April 21st to May 21st there is an actual “spring snow” festival due to the seeds making a confetti celebration of spring throughout the city from 75,000 elm trees. The elm tree (iep bos) has a shallow root system and is planted along the canal system, as well as other locations. Amsterdam is known as the “elm capital” of the world. We don’t walk through the snow in the winter very often, but every spring there are piles and “drifts” of seeds to walk through. 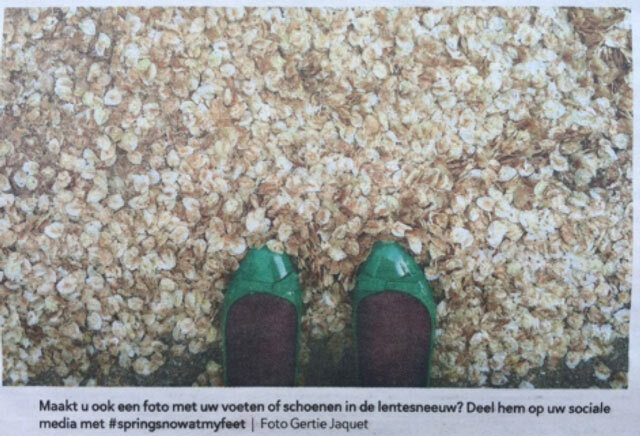 The newspaper even encourages people to share photos with their feet or shoes in the spring snow.